Thank you to everyone who sent get-well wishes. I am feeling a lot better (and back to knitting)! Don’t know what’s going on with the server PI is housed on. There have been issues the last couple of days. I have been in contact with my host, and hopefully things will get straightened out soon. If you have problems with the site, I can only suggest trying back in a little while to see if it’s working better. If you have continued problems for several hours, please shoot me an email. I finally, finally, finished the socks I started oh, so long ago! I haven’t been able to come up with a good name for these, so I’ve dubbed them simply The Beach Socks. The yarn was purchased last spring at the Magical Moebius Festival in Newport (down on the coast), so they hail from the beach so to speak. And the colors are very seascape. 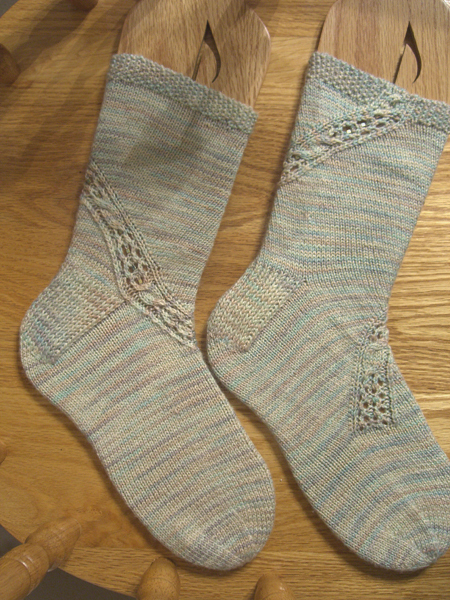 The pattern is the Coriolis Sock from Cat Bordhi’s New Pathways for Sock Knitters: Book One. But, true to form, I wanted to try something a little bit different, so I inserted lace, cables and beads into the Coriolis band that winds around the leg. I tried for the feel of waves foaming against the shore for the lace insert. I think I was fairly successful. Theoretically the Coriolis band can be any width. Mine is 7 stitches wide: two purl stitches to either side of a 5-stitch lace and cable pattern. I couldn’t decide what to do for a cuff, so in the end I just did a simple seed-stitch with the final cable pulled up into the cuff area. I really like the beads that I used, but I didn’t want to get too crazy with them so they are found only inside the lace on the leg. There are no beads on the foot, because they would not be comfortable inside my shoes. I admit that these are a bit tight to get on, but once on they fit wonderfully well and don’t sag or bag at all. The coriolis band wants to pull the whole sock diagonally a bit. They feel better if I don’t fight with it and just let the leg twirl around a little. You can see from the pictures that there is a slight twist to the leg. If I were to knit these again, I think I’d use a different increase instead of the kfb, which tends, in my knitting, to be tight. 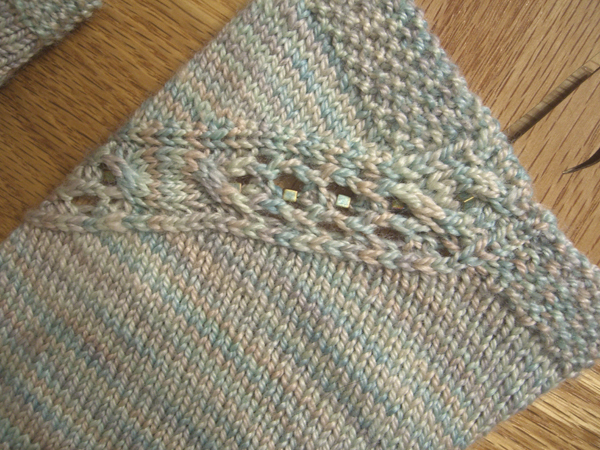 The closeup shows the seed-stitch cuff and the beads in the lace. The last cable in the cuff also sports a bead. Strangely enough, I now have no socks on my needles — and that’s probably a good thing because I need to finish a baby sweater by next week. Needles: two 24″ Addi Lace circulars, US#1 (2.5mm). I used my own standard heel pattern, which is visually similar to Cat’s but narrower. I attempted to make a longer, narrower whirlpool toe, but was not entirely successful. This is still not my favorite toe for fit, although I love the way it looks. Seed stitch cuff and tubular (i.e. Kitchener) bind-off. Do not accept anything simply because it has been said by your teacher, or because it has been written in your sacred book, or because it has been believed by many, or because it has been handed down by your ancestors. Accept and live only according to what will enable you to see truth face to face.